Hello! Today’s recipe has wonderful sweet, sour, and zesty flavours that are delicious and refreshing. A yummy drink that is great to make as a quick breakfast or mid-day snack and it comes together in just a few minutes. Pineapple (fresh or frozen): This wonderful tropical fruit that has scrumptious sweet and tart flavours and is a good source of vitamins C, B1, manganese, and dietary fiber. In this recipe, I used frozen sweet pineapple. I always buy a bag of frozen pineapple chunks from the supermarket to make smoothies as it’s one of my favourite fruits. If you want to use fresh pineapple, pick one that’s firm, heavy for its size, and smells sweet at its stem. 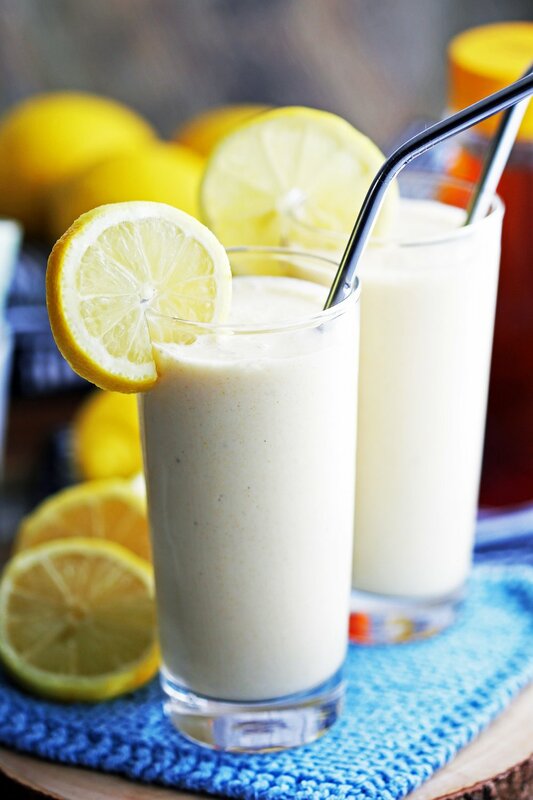 Fresh Lemon Juice: Bright flavours that brings zing to this smoothie. It’s perfect for breakfast to help you wake up! Add in the lemon zest if you like for added lemon-ness, but it may also give off a hint of bitterness as well. Bananas (fresh or frozen): This fruit adds more natural sweetness and is rich in fiber, potassium, vitamin B6, and vitamin C.
I used a frozen one, but a fresh banana would work in this recipe too. Greek yogurt: Creamy, thick Greek yogurt has a tangy taste and is a good source of protein too. Unsweetened almond milk: My go-to non-dairy milk. It has a creamy texture and slightly nutty flavour that I like. Use any type of milk you prefer. Pure Honey: The distinct rich sweetness of honey compliments the fruits in this drink. Ground Turmeric (optional): This golden-yellow spice is lightly aromatic and is known for its antioxidant and anti-inflammatory properties. It gives the smoothie a light yellow colour. Ice: Only necessary if you are using both fresh pineapple and banana and would like a slightly thicker smoothie texture. Delicious and flavourful: Yummy sweet, tart, zesty, and sour notes in this smoothie that’ll put some pep to your step! This smoothie has a creamy texture that’s pleasing to the palate too. Refreshing and cool: Perfect to enjoy on a hot day. Simple and quick to make: It takes about 5 minutes to make. Simply place all the ingredients in the blender and combined until smooth. Great to make for a quick breakfast or snack: Fill up a travel cup to take it with you on-the-go. Looking for more smoothie recipes? Check out these four! I hope you try this smoothie recipe! If you do, please leave me a rating and comment down below or tag me on any of my social media. I’m @yay_for_food on Instagram. Please share a picture! Once blended, taste and adjust according to preferences such as adding more yogurt for a thicker smoothie or more pineapple or banana for more sweetness. Nutritional information represents one serving for a total of three servings.